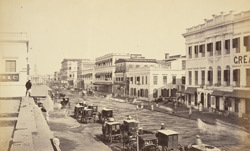 Photograph of Old Court House Street from 'Views of Calcutta and Barrakpore' was taken by Samuel Bourne in the 1860s. Old Court House Street is located on the eastern side of Dalhousie Square. In this view, St. Andrew's Church is visible on the north corner of Old Court House Street and Lal Bazar Street.